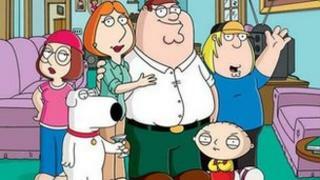 Episodes of US comedy series Family Guy and American Dad were dropped on Sunday in the wake of Friday's shootings in a Connecticut school, which left 26 dead. Tarantino's latest film, spaghetti western Django Unchained, features graphic violence, including buckets of blood exploding from characters as they are shot. Django Unchained is nominated for five Golden Globes at next year's awards. The Oscar-nominated director, whose work includes Inglourious Basterds and the Palme d'Or winning Pulp Fiction, said blame for violence should fall on those guilty of the crimes. Foxx said: "We cannot turn our back and say that violence in films or anything that we do doesn't have a sort of influence. It does." Foxx stars as the protagonist of Django Unchained, a slave living in the Deep South who sets out to rescue his wife from a brutal Mississippi plantation owner, played by Leonardo DiCaprio. "The media's responsibility is greater than the story teller is because... Django is violent, but it's not inspiring violence. "Because actually to me I find violence... to that degree repulsive. The fact that it looks so impressive is because it's on a big screen." Kerry Washington, who plays Django's wife Broomhilda, said she believes the film's explicit brutality serves an important purpose in educating audiences about the atrocities of slavery. On Saturday, premieres in Pittsburgh and Los Angeles for Tom Cruise's new action film Reacher and Billy Crystal comedy Parental Guidance were postponed in light of the shootings. Paramount Pictures said the decision for Jack Reacher was made "out of honour and respect for the families of the victims whose lives were senselessly taken". The film opens with a sniper shooting several people dead. Fox said Parental Guidance was postponed "in light of the horrific tragedy". "The hearts of all involved with this film go out to the victims, their families, their community, and our entire nation in mourning."